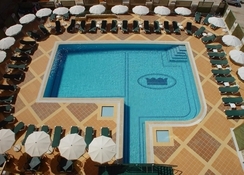 The Real Bellavista Hotel & Spa is luxury 4-star hotel in Albufeira, Portugal. The hotel is located just 2.4km away from the local beach. The hotel houses 4 swimming pools on its premises. The hotel has an all-inclusive policy to make the guests’ stay a comfortable experience. The hotel also houses a luxury upmarket spa and wellness centre. 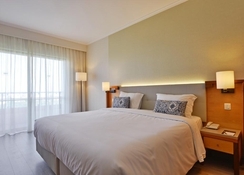 There are over 190 tastefully-designed rooms with all luxury essentials. The hotel also has 2 bars and 2 restaurants on its premises that serves a varied range of delicacies from Portuguese and other international cuisines along with local alcoholic and non-alcoholic beverages. The proximity of the hotel to the beach and the town makes it for a perfect destination for vacationers looking to have a sunny holiday and explore the culture and heritage of Portugal. 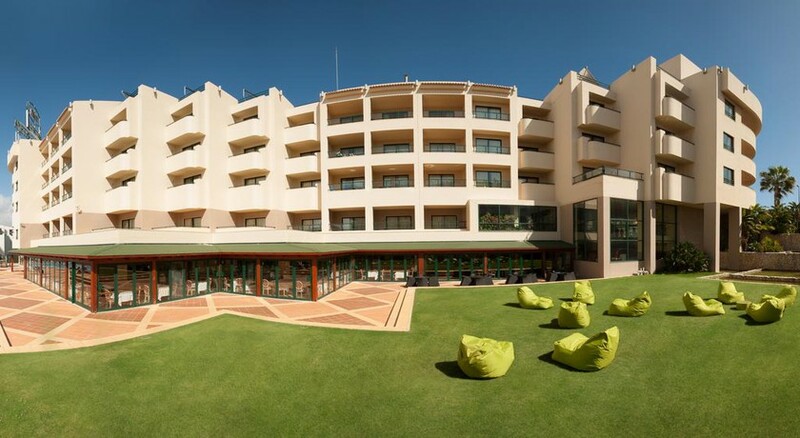 The Real Bellavista Hotel & Spa is located 35.8km away from the Faro Airport. The town of Albufeira is 1.6km away from the hotel. The closest beach is 2.4km away. The Albufeira Main Bus Station is 700m away from the property. Popular landmarks like the Albufeira Stadium, Sagrada Família Chapel, Albufeira Shopping Center, Albufeira Main Bus Station, Pau da Bandeira Belvedere, The Strip - Albufeira, Bullring Albufeira, Parking Garage Albufeira, Fishermen's Square, Fisherman's Beach, Albufeira Old Town Square, Oura Beach, Albufeira Marina, Algarve Shopping Center, Tunes Train Station and Vilamoura Marina are located within a range of 10km from the hotel. For their guests’ local excursions, the hotel can arrange for rental cars on request. Airport drop-off and pick-up can also be arranged. The Real Bellavista Hotel & Spa has 193 tastefully decorated rooms that ensure the guests have a luxurious stay. The rooms are further categorised into 5 types based on amenities, facilities, space and number of occupants. Classic Room, Premium Room, Superior Room, Junior Suite and Real Suite are the options available. The rooms are equipped with all facilities and amenities essential for a comfortable stay. 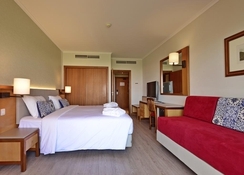 The rooms are equipped with air conditioning, minibar, telephone, television with satellite channels, hairdryer, bed linen, bath linen, essential toiletries, etc. The Real Bellavista Hotel & Spa houses 2 restaurants, Real Cozinha Restaurant and Bar Bellavista, that serve breakfast, lunch, dinner and snacks in buffet style and A La Carte style. The food served includes dishes from traditional Portuguese and international cuisines. The bars, Real Bar, Sunset Pool Bar and Sunrise Pool Bar, serves local wines, beers, alcoholic beverages, signature cocktails and non-alcoholic beverages. The guests can choose the all-inclusive package while bookings. The guests can also choose to visit the Albufiera, which is nearby, and try local eateries and bars. The Real Bellavista Hotel & Spa houses 4 outdoor pools This serves as an excellent recreational aspect of the hotel. For kids, the hotel has clubs, magic shows and other such activities. The hotel has various entertaining activities every day to keep the guests engaged. The guests can also enjoy sunbathing at the nearby beach. If interested, one can also try water sports like water-skiing, etc. offered at the beach. The guests can also enjoy sports like billiards, tennis, table tennis, etc. The hotel also has local tours, SjoelBak, aquafit, volleyball, Petanque, Portuguese classes, darts game, table tennis, archery, show of reptiles and macaws, live music, entertainment shows, dance, etc. on offer. Me and my husband recently had a long weekend break in this hotel and would highly recommend it....we were bed and breakfast, which was very nice with plenty of choice. The hotel room was immaculate, bed was so comfortable. Hotel staff were all very friendly and reception staff were very helpful. This hotel was a little walk to the nightlife...but 10 mins or so to the old town. We enjoyed a little walk down to the shops and beach and exploring Portugal. We would recommend this hotel and would definately stay here again. I am not sure it is ideal for families as pools are fairly small and its a walk to get to shops and beach but perfect for couples looking for a relaxing time together. Overall loved this hotel. The food was very good and a great selection. We had two children with us and I've never seen them eat so well. They had a great kids club and evening entertainment for adults and children. Rooms was lovely and staff really helpful and friendly. They left us out food in our room because we had a latee flight and had missed food. Would 100% go back. We stayed here for a week. The facilities were great, the staff were very friendly and welcoming. There is a good array of activities throughout the day. The food and drink was to a good standard. The regular shuttle bus is a very free and easy way to get around albufeira. The hotel itself is situated approx. 5-10 minute walk from the local shops and is in between the old and new town. Lovely hotel although main pool area needs some updating. Very friendly and attentive staff.